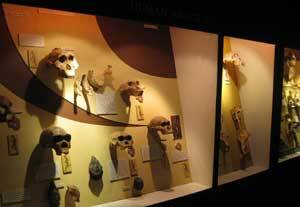 (Left) Display for human evolution, in the final case of an extensive exhibition on the evolution of life on earth in the Geology Museum, Windhoek, Namibia. 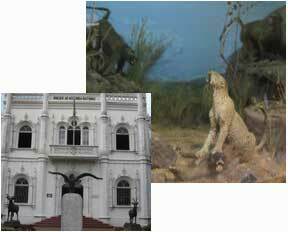 The eternal battle between apes and big cats; diorama in the beautiful Museu de Historia Natural, Maputo, Mozambique. 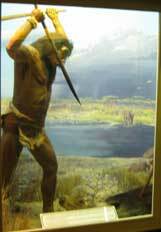 Diorama depicting stone age hunter, McGregor Museum, Kimberley, South Africa. A small museum in the Stevenson-Hamilton Memorial Centre, Kruger National Park, South Africa, features a display on human evolution. Most museum exhibitions are more interesting when they are based on the institution's own collections. When it comes to human evolution certain African museums are outstanding. A key organisation in South Africa is the Institute for Human Evolution, headquartered in the University of Witwatersrand in central Johannesburg. The Institute administers the Origins Centre, in the same location, and the Cradle of Humankind World Heritage Site, located around Sterkfontein just outside the greater city area. In April 2010, members of the Institute and their colleagues announced the latest important fossil discovery for human evolution: Australopithicus sediba. The University Medical School also houses one of the most important fossil collections in the world. 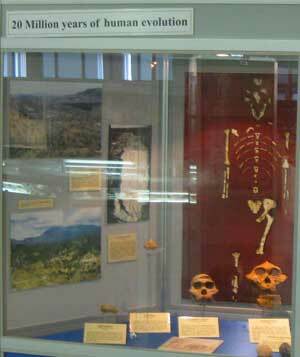 (Left) Exhibition on human evolution near the entrance to the Institute for Human Evolution, University of Witwatersrand, Johannesburg, South Africa. This display includes a number of reproductions of fossils held by the Institute. Plaster casts of fossil skulls used for everyday study and demonstration at the Institute for Human Evolution. The Origins Centre, University of Witwatersrand, Johannesburg, South Africa. 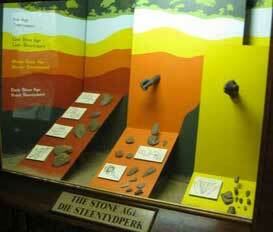 A spectaclar exhibition of stone tools in the Origins Centre, University of Witwatersrand. Tools from important locations for the appearance of modern humans, on the South African coast. Well-presented displays tell the story of the evolution of life and humans, and introduce the visitor to the Cradle of Humankind World Heritage Site at Sterkfontein Caves. ...an actual dig site. Fossils are found in breccia deposits; e.g. 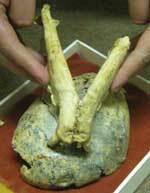 'Little Foot', one of the most important Australopithecus specimens ever found. Deep underground, the breccia walls where 'Lttle Foot' was found may hold the almost complete skeleton. 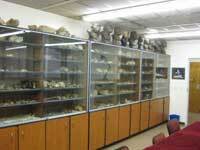 In the medical school of the University of Witwatersrand, an enthralling fossil room. 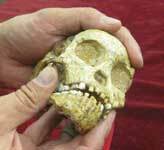 Perhaps its greatest treasure, the three pieces of the Taung child skull sit in their box. The pieces assembled; their calcite sparkles under the light. 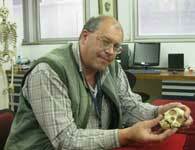 Bernhard Zipfel, University Curator of Collections, holds the Taung child skull. Another key institution is the National Museum of Natural History or Transvaal Museum, in Pretoria (part of Ditsong, a relatively new institution created from a number of South African museums). Its public exhibitions include displays illustrating the evolution of life on earth, and a particularly extensive treatment of human evolution. Again, its own fossil collections are an important ingredient in the displays. (next right) a perfect fit. have had to dodge these too. The Study ackowledges its immense gratitude to Prof. Francis Thackeray, Director, Institute for Human Evolution, Dr Bernhard Zipfel, University Curator of Collections, Bernard Price Institute for Palaeontological Research, both at the University of Witwatersrand, Johannesburg, and Stephany Potze, Curator, National Museum of Natural History (Ditsong), Pretoria, for their time and great generosity in giving access to their wonderful facilities and the treasures they contain. Text © Copyright Craig Robertson, 2010, except where otherwise attributed. Photos by Craig Robertson; the displays and objects depicted of course all belong to the institutions respectively and respectfully indicated.